I love getting samples at the drugstore, in magazines or in the cosmetic store. I usually save them for daytrips, weekendbreaks or holidays, but then I thought it would be fun to just use them and share my thoughts with you, here on ‘the good, the fab and the lovely’. 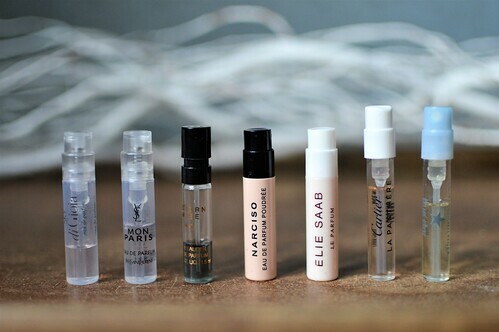 Read on to find out which samples I have tried out… and would I buy the fullsize version?! In this first part of ‘trying out some samples’ I give you my thoughts on a couple of fragrance samples I received at my cosmetic store. Occasion? I used this sample to go to work. First impression? Lovely, soft and citrusy smell. Summery, but the scent was gone very quickly. Nice smell to wear to work: easy-going and not too heavy. To buy or not to buy? I wouldn’t buy a fullsize bottle: the scent didn’t last for long and it’s a fragrance that doesn’t stand out in my opinion. Nothing that will make heads turn! First impression? This fragrance is quite sweet, fruity and floral. I used up the entire sample during the day: I sprayed a bit upon arrival and again in the late afternoon. The fragrance stayed quite long and it kept on smelling the same as in the beginning of the day. To buy or not to buy? I wouldn’t buy a fullsize bottle as I think it smells too sweet. First impression? Vanilla and spices were the first words that sprang to mind. It’s a warm smell, actually perfect for Christmas Eve! My skin held on to this fragrance quite well and I liked it. To buy or not to buy? This definitely is a smell which stands out a bit more and I could be persuaded to buy a small bottle. I would definitely not buy a large one as I think I would be bored with the smell quite fast as the vanilla is quite explicit. First impression? Woody, musky smell. Now that sounds like something I would like, but I wasn’t wowed by this fragrance as quickly after spraying it on, it smelled a bit mouldy. That changed for the better fortunately, but as I said… not wowed by it! To buy or not to buy? I wouldn’t buy this fragrance. Here’s a post about two of my all-time favourite fragrances! This entry was posted in Beauty, Fragrances, samples, Uncategorized and tagged armani, beauty, estée lauder, fragrance, modern muse, Narciso Rodriguez, samples, Yves Saint Laurent. Mon Paris was my perfume when I was younger. I also don’t like the smell now anymore. I recently used a sample of Tiffany & Co and got the fullsize for Xmas…. Love it. The Mon Paris would indeed attract a younger public… we’ve passed the Mon Paris phase I’m afraid Annette!!! Great tips! Saves us all time and money. Leuke post! Enkel de eerste zou mij kunnen bevallen, enkel spijtig dat hij zo snel weg is… De anderen zouden voor mij te zoet/zwaar zijn.